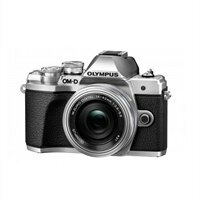 Olympus OM-D E-M10 Mark III KIT with 14-42MM EZ Lens, Case, 16GB SD Card - SilverYou love photography, but let’s keep it real. You travel to enjoy your vacation, not to be your family’s on-staff photographer. You want a sharp shot of your dog’s epic mid-air catch, but you don’t have time to memorize a user manual. The E-M10 Mark III is just for you. It’s small and lightweight so it’s effortless to take along. The simple to use touch screen interface and exclusive Shortcut Button remove all mystery from camera settings. And foolproof image stabilization virtually eliminates motion blur and shake from your stills and 4K video. The E-M10 Mark III. Your photographic journey starts here.